On September 12, dressed in civilian clothes, Hitler went to a meeting of the German Workers' Party in the back room of a Munich beer hall, with about twenty five people. He listened to a speech on economics by Gottfried Feder entitled, "How and by what means is capitalism to be eliminated?" This enraged Hitler and he spoke out forcefully against the man for the next fifteen minutes uninterrupted, to the astonishment of everyone. One of the founders of the German Workers' Party, Anton Drexler, reportedly whispered: "...he's got the gift of the gab. We could use him." After Hitler's outburst ended, Drexler hurried to Hitler and gave him a forty page pamphlet entitled: "My Political Awakening." He urged Hitler to read it and also invited Hitler to come back again. Early the next morning, sitting in his cot in the barracks of the 2nd Infantry Regiment watching the mice eat bread crumbs he left for them on the floor, Hitler remembered the pamphlet and read it. He was delighted to find the pamphlet, written by Drexler, reflected political thinking much like his own - building a strong nationalist, pro-military, anti-Semitic party made up of working class people. 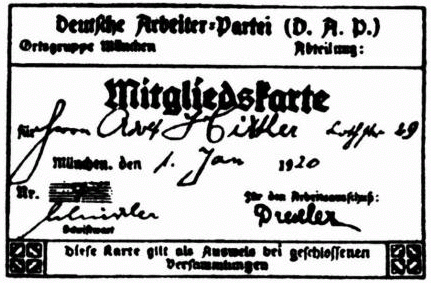 In Mein Kampf, Hitler describes the condition of the party: "...aside from a few directives, there was nothing, no program, no leaflet, no printed matter at all, no membership cards, not even a miserable rubber stamp..."